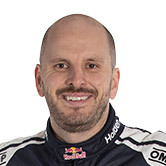 Paul Dumbrell has handed Jamie Whincup a start from P1 in the final ARMOR ALL Race for the Grid. The star co-driver got the jump on Steve Owen in the Supercheap Auto Racing Falcon and built his lead, which blew out to seven seconds by the end of the 20-lap race. There was a collision at the treacherous turn one and it was defending champion Mark Winterbottom’s co-driver Dean Canto who was punished with a drive-through penalty, after contact knocked Tony D’Alberto (with Scott Pye) and Steven Richards (with Craig Lowndes) off the track. 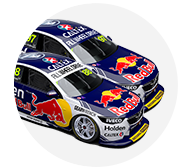 Richards leaves Championship contender Craig Lowndes to start 18th in the next sprint, while Mark Winterbottom will be 25th. Owen held down second easily but a late battle built for third with Warren Luff (Garth Tander) putting pressure on Luke Youlden (Fabian Coulthard), and finally taking the spot on lap 19 of 20. Jonathon Webb (Will Davison) also snuck through, for fourth, leaving the DJR Team Penske car to finish top five. The Volvos followed, with Alex Premat (Shane van Gisbergen) keeping it clean and sailing home in eighth. At the end of the coverage, Canto was seen apologising to D’Alberto in the DJR Team Penske garage.